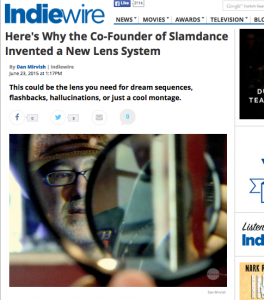 Dan Mirvish wrote an article highlighting his invention MirvishScope, and it’s on the front page of Indiewire! Click here to read the article showcasing this one of a kind, two-handed lens system. It will give you a unique look not found anywhere else in the world. Consider pledging $35 or more on the Bernard and Huey Kickstarter to get a MirvishScope of your own! Previous PostCall for Redditors!Next PostReddit AMA LIVE! !